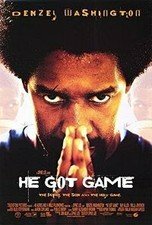 Denzel Washington stars in Spike Lee's acclaimed drama as Jake, a recently paroled convict who has a week to convince his son, Jesus, who is the most sought-after high school basketball player in the country, to attend the governor's alma mater. The problem is that Jake was convicted of murdering his son's mother and Jesus wants nothing to do with him. With NBA star Ray Allen, Milla Jovovich and Ned Beatty. 137 min. Widescreen; Soundtrack: English Dolby Digital 5.1; theatrical trailer; scene access.